Whenever stylish New Yorkers come to Seattle for a visit, one of the first things they remark is the drabness of our dress. No matter the social strata or season, Seattleites seem to prefer to wear clothes that match our climatic reputations: gray, grayer, grayest. A bright splash of color for us is the dark green of an old-growth forest or maybe an olive to match our famous banana slugs. If Seattle ever hosted an Easter Parade, I’m afraid out-of-town onlookers would mistake it for an early Earth Day march. So it is always a wild surprise when I scan the Fill and find a Wood Duck. Wood Ducks are shy residents of our secluded ponds and sloughs. They contradict everything you would expect of a native. The males wear elaborate, drooping headdresses of iridescent green, purple, and white. Their bills are painted with a kind of flame-red lipstick, matched by the red of their eyes. Their body feathers display an array of stripes, herringbone, and dots, mixed with broad swashes of mahogany, taupe, turquoise, and black. The females are understandably more understated, but even they sport elaborate makeup – in their case, a white kohl around the eyes that would make any ancient Egyptian female swoon with envy. 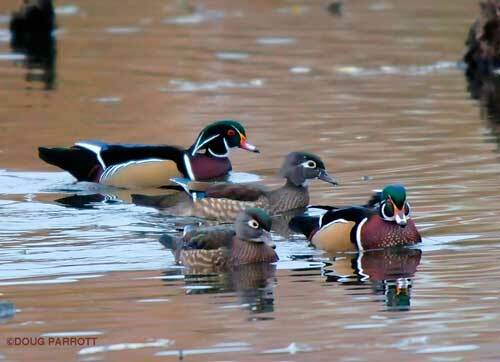 Like many of their Beautiful People counterparts, Wood Ducks prefer to keep their private lives private. At the moment, couples are strengthening the bonds of their partnership, getting the nursery ready, and trying to stay away from their adoring fans. If you’re lucky, you can glimpse them in the early morning or late afternoon. Perhaps they figure that’s when most of us paparazzi are either still in bed or at dinner, and it’s safe for these Seattle stars to come out. This entry was posted in Uncategorized on April 29, 2010 by constancesidles.